As Scotland's only theatre wholly dedicated to new writing, we strive to discover, nurture and produce the brightest new voices across Scotland, the UK and Ireland. Each year we open our submissions window seeking bold, brilliant and innovative new plays. We know that exploring big ideas works best on our stages. We’re looking for stories with as much heart as head and for writers that have something new to say about the world today. Whether you’re an established playwright or a first-time writer with a brilliant story, we want to hear from you! Open Submissions breaks down the boundaries, allowing your work to be read by the Traverse’s team of readers. Scripts are read anonymously allowing us to focus solely on the story you have to tell. Connecting us with new work and new writers; it is the first step of a creative and fruitful journey from page to stage. We particularly encourage submissions from voices and communities which are under-represented in theatre - both onstage and off. This year we will also be selecting five of the most promising plays in order to develop them through in-house dramaturgy and round-table readings with professional actors. These development periods will happen throughout the year culminating in an Open Submissions Festival of script-in-hand readings, showcasing the best new plays to industry professionals and Traverse audiences alike. Provoke us, entice us, move us and tell us your story. Come in, we’re open! If you have questions, head to the Open Script Submissions – FAQ page. Please make sure you feel the play submitted best represents your work to date and familiarise yourself with some of our recent work (Mouthpiece by Kieran Hurley, What Girls are Made of by Cora Bisset, Gut by Frances Poet) and, if you can, with our spaces: the expansive Traverse 1 and the intimate Traverse 2. To ensure an unbiased response to your play, all scripts received through Open Submissions are read anonymously. Please remove your name and contact details from the script itself, and check that your play is clearly formatted, with page numbers, cast list and potential cast doubling noted. We will send you an email to acknowledge your submission. Following that, we will try to respond to your submission within 9 months. We receive a high volume of scripts each year and appreciate your patience on a response. Unfortunately, our resources do not allow us to provide feedback to all writers. In addition, this year we will also be selecting five of the most promising plays in order to develop them. You will be contacted if your play has been shortlisted for this opportunity, and contacted once again if selected for script development. 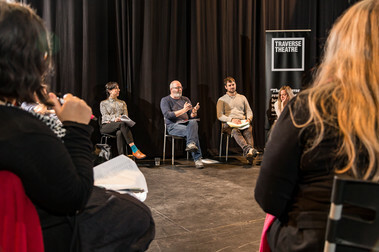 The Traverse aims to hold workshops and opportunities for writers to explore and hone their craft, with leading playwrights working with the Traverse throughout the year. 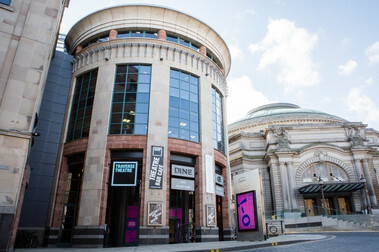 Scotland and UK Theatre scene has a rich tradition of producing new writing and supporting new writers to achieve their potential.